Scientific Games now provides all online and mobile lottery games in Canada’s Atlantic provinces. In March of 2015, Scientific Games and the Atlantic Lottery Corporation (ALC) inked a multi-year interactive gaming contract. Scientific Games was under commission to coordinate, build, and fully integrate a digital lottery system for the gaming regulator. For decades, Scientific has specialized in the provision of land-based and digital lottery sales technology. The company already provides digital gaming services for the majority of the country’s provinces and territories, making Scientific a perfect fit for Canada’s Atlantic region. The contract started as a 5-year deal, with optional extensions of 15 to 20 years down the road. The company got to work right away on the new lottery system. Implementation was originally projected for mid- to late-2016. It took quite a bit longer than anticipated, though. Now, more than years later, the new online and mobile lottery tickets are finally available to customers. 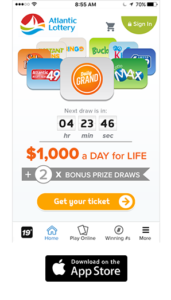 As of October, 2017, the new omni-channel lottery system is available to all age-appropriate players (19+) residing in the Atlantic provinces of New Brunswick, Nova Scotia, Prince Edward Island, and Newfoundland and Labrador. The Atlantic Lottery’s President and CEO, Brent Scrimshaw, commented on the update to Scientific Game’s new platform. Scientific’s Senoir VP of Global Gaming Systems, Pat McHugh, was equally proud of the recent integration and impending opportunities it presents for the two groups. Now that the service is active, McHugh says the staff at Scientific is working closely with the ALC to highlight strategic marketing paths and innovative gaming solutions to the network’s many consumers. Per the initial roll out, players in the Atlantic provinces now have access to mobile lottery scratch off tickets. The new digital instant games are available to mobile users anywhere (within the Atlantic provinces) an internet connection is available. Players can purchase, scratch and redeem winnings from these new electronic games directly on their smartphone or tablet devices. “The new digital instant and draw games have been well received by Atlantic Lottery players, and have already created a significant lift in sales,” McHugh said. Scientific Games and ALC also made the calculated decision to temporarily reinstate the lottery’s second-chance ticket program. Players with a winning or losing scratch ticket can visit 2Chance.ca to enter weekly and monthly second-chance drawings from now through February 28, 2018. See the complete term and rules here. MMO Loot Boxes: Piquing Curiosity or Video Gambling?